I see the Socialist Resistance website is promoting a "must-have Christmas gift for the leftist in your life" - a Philosophy Football t-shirt bearing a quote from Leon Trotsky. Must have? For an increasingly isolated strand of leftism, perhaps. Personally I wouldn't dream of walking around with a claim for the inevitability of revolution made in 1925 that seems... well, somewhat delusional. And overdue. 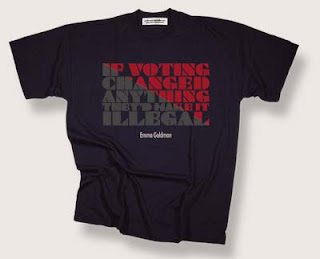 Far more topical, in light of the depressing choice between pro-war, pro-business political parties at the forthcoming general election, is the t-shirt bearing the anarchist Emma Goldman's statement - "if voting changed anything they'd make it illegal". Sacré bleu comrade, ye have little faith in the 57 varieties of revolutionaries! The revolution may be overdue but it will happen I tells ya, all we need is an upsurge in class consciousness, struggle....and lots of other pre condtions ...and then it's barricades at dawn and storming the Winter Gardens..
Jeez Louise, I thought I was sarcastic! Here's to storming the (Blackpool) Winter Gardens instead of the Winter Palace in the name of class consciousness! Actually, you're spot on about the better quote from Emma Goldman - that WOULD be a t-shirt I'd buy too.